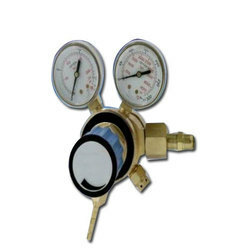 We are the leading manufacturer of Gas Regulators. We are engaged in manufacturing a wide range of Gas Regulators which play an important role in our daily operations of a gas chromatograph. Our company manufactures various type of single stage and double stage regulators. Gas regulators supplied by us are leak proof and indicates correct pressure & are smooth in operation. The duration of gas use time helps to identify whether a single-stage or two-stage regulator provides the best service. A single-stage regulator reduces cylinder pressure to the delivery or outlet pressure in one step. This type of gas regulator is recommended when precise control of the delivery pressure is not required because delivery pressure variations will occur with decreasing cylinder pressure. A two-stage regulator is used when accurate delivery pressure is important. A two-stage regulator reduces the cylinder pressure to a working level in two steps. The cylinder pressure is reduced by the first stage to a preset intermediate level, which is then fed to the inlet of the second stage.